CAMDEN, N.J. (AP) — Jimmy Butler listens to country music, enjoys playing cards and drives a minivan. Oh, the four-time All-Star forward loves to win. 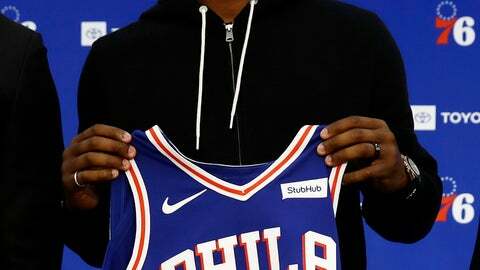 Butler was greeted by more than 250 employees of the Philadelphia 76ers at his introductory news conference at the team’s practice facility Tuesday. He made it clear winning a championship is his main priority. The Sixers believe adding Butler to a roster that includes Joel Embiid and Ben Simmons will allow them to compete for an NBA title. They won 52 games last season and advanced to the Eastern Conference semifinals after going 75-253 combined the previous four years. Robert Covington, Dario Saric and Jerryd Bayless were traded to Minnesota along with a 2022 second-round draft pick for Butler and Justin Patton. Butler is expected to make his debut with his new team on Wednesday in Orlando. The 29-year-old Butler has averaged 21.8 points a game since the start of the 2014-15 season, the 13th-highest clip in the NBA over that span. The deal to Philadelphia ends a two-month saga that began when Butler told the Timberwolves shortly before training camp that he wanted to be moved. Critics, often citing anonymous sources, called Butler a disruptive presence on a team. Butler defended his reputation. “You really wouldn’t know who I am unless you’re around me every day,” Butler said. “For the most part, that’s why I don’t worry too much about what everybody says. If you know me, if you’re around me, you know my heart. You know how I go about what I go about. Brand said he spoke to several of Butler’s former teammates and came away more than satisfied. Butler’s hard-charging style of play will certainly fit well in Philadelphia. Butler isn’t concerned about not getting enough touches on offense with Embiid, Simmons, JJ Redick, Markelle Fultz and others on the Sixers. He handled the ball a lot in Minnesota but doesn’t worry about fitting into coach Brett Brown’s system.